Mr. Deepak Sharma, he has been associated with Udayan Care as a full-time volunteer since August 2013 as the Honorary Director of 'Jagshanti Udayan Ghar' in Greater Noida, as also Udayan Care's IT training Programmes. 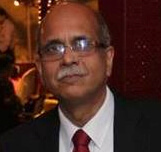 By qualification an Electrical Engineer, he has served different corporate and PSUs for 31 years. He voluntarily quit his job with the Tata Teleservices Ltd, a telecom company, in Aug 2013 to fulfill his long cherished dream and desire to give back to society by getting associated with an NGO working for upliftment and education of girl child. He found Udayan Care the right platform to accomplish his dream, after being a part-time volunteer, initially for a couple of years with Udayan Care Noida Homes, even before 2013. He is also associated in an Honorary role with another NGO ROSES (Road Safety and Emergency Services) working primarily with school children and youth spreading awareness and creating a culture of how to be safe on roads.